"Too loud is not in my vocabulary." The Full Monty director Peter Cattaneo brings us The Rocker, an uneven, lightweight comedy about a rock drummer who was booted from his 1980s hair-metal band on the eve of them signing a big recording contract. It's been 20 years, but poor Fish Fishman (Rainn Wilson) can't let it go, and as he wanders through his boring call center day job at an industrial shelving company he is constantly haunted by the decades-long mega-success of his former band Vesuvius. He is given one final chance to rekindle his rock star dreams when he is recruited to play drums in his teenage nephew's (Josh Gad) garage band A.D.D., all of which we know will eventually lead to some kind of battle-of-the-bands confrontation of sorts with his former bandmates. While Wilson is terrific as Dwight Shrute on The Office, his cocksure Fish is not necessarily a departure; it's more of a long-haired clone. He's clueless and brash, full of odd knowledge and bravado, and I'll bet it won't take a film scholar to peg the eventual romantic sparks between him and Christina Applegate, who plays the mom (!) of A.D.D. 's guitarist/vocalist (apparent teenage heartthrob Teddy Geiger). No one will confuse The Rocker with complex comedy greatness, but some funny does show through here and there, especially from Jason Sudeikis; he plays A.D.D. 's slimy manager, and he constantly gets the film's best bizarro lines, including a great one about John Lennon rolling over in his grave. 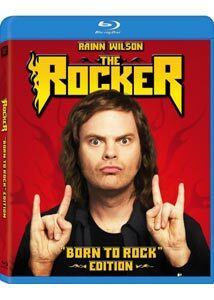 A film snob would no doubt mock The Rocker as low-rent schlock, but I've never been one to shy away from admitting the unpopular. This is one of those titles that screams to be mercilessly dismissed, but in good conscience I just can't. A perfect film? Nope. Yet I laughed, and more than once, too. Was I ever surprised at the way the story developed? No. Was there ever any doubt how things be resolved? No. Did Wilson sometimes threaten to ham it up to nth degree? Yes indeed. But there were moments of genuine dumb comedy charm, and for all the predictability and physical shtick the occasional funny does come through. The bad does outweigh the good here, though an occasional laugh or two pops up just when it seems that the film has worn out its premise. Wilson may be too closely associated with the Dwight character to yet branch off to film roles that don't parlay that same level of annoying know-it-allness. The idea that if you like Dwight then you'll like his character in The Rocker isn't that far from the truth; they could be brothers, or at the very least relatives. The odds that we'll see Wilson as a cold-blooded assassin or a sensitive housepainter in some future film seem unlikely; Wilson, for now, means Dwight, and it is assumed audiences want a familiar variation of that character. For the curious, look for a cameo by former Beatles drummer Pete Best, the real-life parallel to Wilson's Fish Fishman character. Image Transfer Review: Fox continues their habit of issuing low quality screeners, so I'm unable to provide an accurate image transfer review. My copy was laden with all manner of compression issues, often rendering the image nearly unwatchable. I can tell you it is in 1.85:1 anamorphic widescreen, but beyond that is anyone's guess. I trust the street version will look much cleaner. Audio Transfer Review: The primary audio track is presented in Dolby Digital 5.1 surround, and though not a showcase, it suits the material. Surrounds get used fairly often (especially for a comedy), while the occasional concert sequence or music montage offer up a big sound, with plenty of deep bass. Voice quality is clear at all times, with no evidence of hiss or distortion. A French 2.0 surround mix is also included. Extras Review: This "Born To Rock Edition" suffers from a case of quantity over quality, and though there's a lot here most of it is generic or pointless; thankfully all of it is brief. Things commence with two commentary tracks, one featuring director Peter Cattaneo and actor Rainn Wilson, the second containing actors Josh Gad, Teddy Geiger, Emma Stone, and Jason Sudeikis. If you must, take the Cattaneo/Wilson track, as it is easily the most intelligent of the two, and while it often becomes a little too smug for its own good, the discussion of the film's music and how it was presented is of some interest. Steer clear of overcrowded co-star track, as this falls in the self-indulgent-aren't-we-clever school of nonsense, as they blather on, constantly trying to one up one another. A block of ten deleted scenes (16m:11s) is notable for a longer appearance by ex-Beatle Pete Best, and he also gets his proper due in the Pete Best Interview (06m:44s), too. Things devolve quickly, as a dreadful Gag Reel (09m:50s), Matt Gags (02m:36s) and Vesuvius Gags (04m:09s) seem to never end, as do the in-character Behind The Band: Vesuvius (02m:41s) and Vesuvius PSA's (01m:11s). An awkward MTV Panel (05m:51s) features Gad, Geiger, Stone, and a satellite glitch during a Q & A session, while Rainn Wilson: Office Worker (03m:31s) has the rest of cast touting the merits of the film's lead actor. Fox Movie Channel Presents... In Character With The Rocker (02m:16s) is a generic promo piece, and The Music (11m:15s) examines the importance of tunes in The Rocker, and looks at the songwriting aspect. Rock Tales (06m:22s) features most of the cast expounding on their own rock star wishes, and whether or not any of them came true. The feature film is cut into a healthy 32 chapters, and features subtitle options in English or Spanish. The Rocker didn't set the world on fire, but it's not as completely awful as I expected it to be. Sure, this is a formulaic by-the-numbers comedy, but there are a few laughs sprinkled about, so this one could certainly be rental-worthy in a pinch.